Last week, Verizon reveals its plan to include Apple TV 4K as a freebie in their 5G residential broadband packages. The 5G residential broadband package is a new internet plan that is set to launch in the 2nd half of the year 2018. Apple TV 4K which costs $179 in the market provides customers with access to videos on iTunes, Netflix, Hulu and Amzon Prime Video. The reason why Verizon makes the decision to offer Apple TV 4K in the 5G plan is because 5G broadband is still new and not yet well received yet by the locals. No one will be interested in getting their cable modems replaced at an additional fee unless there is an interesting freebie. In the past, Apple has tried hard to get into a partnership with cable companies to include the Apple TV in their subscription plans but they had little success on it. Nowadays, more and more cable companies have consented in offering the Apple TV 4K as an alternative for customers. Apple TV 4K is a black square box which you can use to play 4K videos, and cheap games. The mission of Verizon is to become the first provider of 5G residential broadband and 5G mobile services in the USA. The new plan will only be available in 4 states including Indianapolis, Houston, Los Angeles, and Sacramento.Previously, they give customers a traditional cable box. There are other providers like US based DirecTV and Switzerland based Salt who also offer Apple TV 4K to their broadband customers. Apple TV 4K allows broadband subscribers to access free and paid cable content via a variety of apps. The app will keep a record of the movies that you have watch so you can always refer back to the history to keep track of the watch movies. It can work with Siri and let you control different functions by giving your voice command. You can tweak its setting to allow it to start streaming fast without 5G connection. Verizon also plan provide YouTube TV subscription as an option for subscribers because they know not every customer want an Apple TV 4K. YouTube TV costs $40/month and will provide access to 60 TV networks like ABC, CBS, NBC, Disney, and ESPN. Besides, you also get access to a number of free TV services. The team from Verizon can help you to install the Apple TV 4K while they are installing the 5G modem in your home. Verizon did not release any information about the terms and conditions of this offer. Customers will have to choose between Apple or Google product. Verizon regularly roll out new deals. For example, recently, they offer 6 months of Apple Music subscription for the unlimited data plan. Verizon claims that the 5G broadband offers internet connection that is 10 – 100 times faster than your current internet. It will allow your internet connection to support more devices. This is a temporary promotion because Verizon said that the offer will only be valid during the initial 5G broadband offering in the 4 cities which will take place later this year. Both Comcast and Netflix have jointly announced that the former will be looking to bundle the latter’s service into its cable subscription offerings. Some may remember that back in 2016, the cable giant had began to include Netflix in its X1 interface, so it appears that the two companies are willing to explore more collaborative efforts. Specifically, Netflix’s service will be bundled into the overall Comcast cable subscription in both current and new Xfinity packages. For Netflix, this should give the streaming giant an excellent opportunity to reach new audiences, especially prospective subscribers coming from the world of cable, and okay with the idea of trying out non-traditional media content. Comcast, on the other hand, gets a chance to further expand its existing repertoire of programming. Right now, its Xfinity cable packages already offer a wide range of services, including those that have room for streaming outside of familiar names like ESPN or HBO Go. With its recent teaming up with Netflix, Comcast is now in a very good position to add another streaming option, and one that should suit customers who are accustomed to consumer various forms of media while on the go, sometimes through their smartphones and tablet devices. While it is true that Netflix’s brand has gathered some momentum in the past few years, it might still need to persuade people who grew up with traditional cable services to give the streaming giant a try. On top of that, the cross platform arrangement of Netflix’s deal with Comcast basically grants both companies an opportunity shoot two birds with one stone — catering to their core target markets, while allowing for some versatility (Comcast courting streaming customers, while Netflix appealing to cable subscribers). By the way, for those who want to learn more about Netflix on Comcast’s X1, they better visit Xfinity’s official website now. Cross platform deals like the one that will soon be offered by Comcast and Netflix are actually no longer that uncommon — as a matter of fact, earlier this week Spotify and Hulu had revealed their plans to launch a bundled offer that costs $13 every month. At Hulu’s end, it is basically combining a Spotify Premium music streaming subscription (which typically is priced at ten dollars every month) with an $8 per month Hulu tier, essentially offering a new deal that is five bucks less expensive every month when compared to paying separately for both subscriptions. Plus, the deal does away with commercials, making for an interruption free experience. What broadband providers financial results often fail to reveal! The world of stocks and shares hinges a lot on the statements released each quarter and while most broadband providers include a net loss/gain figure the trend for sometime has been to hide the popularity of the various broadband products. So ahead of the first financial results that will cover 1st January 2018 to 31st March 2018 we have crunched the popularity of the many products we see using our broadband speed test and can share these with everyone. The figures are effectively crowd sourced, so while we may be displaying to one decimal place we believe that the tendency for people who have upgraded to a faster service to test their speed means that we would suggest a +/- 3% error margin on the popular products. The key take-away is that even though superfast services started their roll-outs in 2008/2009 and are available to 95.1% of UK premises that ADSL/ADSL2+ packages are still massively popular. Addressing this reluctance to upgrade, which can be a mixture of reasons including price, lack of knowledge or just lack of promotion by existing provider is the key to ensuring that when lots of full fibre is rolled out that the same take-up patterns are not repeated i.e. a keen 10% will upgrade immediately but looking at a decade or more to reach 50% penetration. The popularity percentages are within each provider, the relative market share in terms of millions of BT, Sky and TalkTalk customers is still something that can be tracked from the financial results. The KCom Lightstream figure at 66.5% looks high considering that coverage of the service in the KCom Hull area is running at 75%, but highlights the tendency we mentioned for people to take their new shiny service for a speed test and also as a KCom is the sole ADSL2+ provider since people are unable to switch to another ADSL2+ provider we don’t see the classic speed test before switching or when searching for broadband deals. We are tracking G.fast popularity but with a footprint of just 131,000 premises and very few tests it is too early in the roll-out to include a figure. The combined popularity of the BT Consumer FTTP services does add up to more than the coverage footprint which is just shy of 500,000 premises by our counting, but in terms of the relative popularity of the speed tiers it tells us something about future full fibre sales, i.e. the fastest speeds if you sell multiple speed tiers are not going to be the biggest seller. Plusnet with a small amount of full fibre tests may be a surprise for some but if an existing customer moves to a full fibre area they will sell the service, why they’ve not moved from this beta type service to a full option is something only Plusnet can answer. TalkTalk with its York UFO footprint, and Sky to smaller extent explains their FTTP figure, but Sky also has a small amount from a trial in Derbyshire and we do see the a very small number of tests in Openreach GEA-FTTP areas and other characteristics that look like a FTTP product suggesting that they may be doing something similar to Plusnet i.e. secret menu with full fibre on it or it could be staff doing testing. The news of TalkTalk Business with a trial of G.fast did not get any coverage from us as we had previous seen some TalkTalk G.fast testing i.e. we know providers often dip their toes in the water and a trial does not always lead to a live service. We hope to repeat this data set each quarter now and will attempt to pre-empt the actual financial results and fingers crossed we will be adding things like full fibre for Vodafone very soon and thus be able to track the popularity of this and other major full fibre expansions. The delivery of full fibre across the UK continues to creep up but things are starting to accelerate after many years where it was mostly talk and plans. 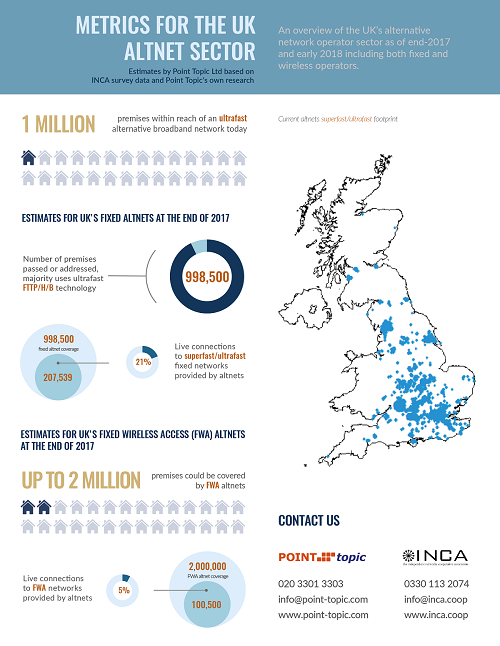 INCA (Independent Networks Cooperative Association) has teamed up with Point Topic in a report that reveals that the number of fixed line superfast connectivity is running 998,531 premises, though there is an additional unusual caveat beyond the normal use of the word ‘passed’ since ‘addressed’ is used. Addressed is something we see with CityFibre so it may be that premises close to its existing metro networks are included too and while the headlines are about full fibre there is some other fixed line technologies involved. Of course no point building these networks if no-one is going to use them and the good news is that some 207,539 connectiions are live so 20.7% take-up. It’s fantastic to see the growth of the new companies building fibre and wireless networks. We’re creating the right environment to stimulate industry investment, and I’m delighted by the altnets’ ambitious plans to reach millions more homes and businesses over the next few years. We are also supporting these goals through government investment in new fibre networks, 5G projects and by removing business rates for new fibre deployment for 5 years. So do we think the close to 1 million is right? As of the morning of 12th April we had 1,058,946 premises passed by full fibre in our database and 493,314 of these were from the Openreach GEA-FTTP products. There are a number of factors to take into account, the infographic includes WightFibre which is around 13,000 premises and we know Hyperoptic has more coverage than is in our system and similar for companies like Ask4 and WarwickNet (serviced apartments, student accomodation etc, this could be 50,000 to 100,000 premises), Vfast with their mix of VDSL2/FTTP and for many new apartments both Hyperoptic and Openreach serve them. Additionally if the reporting from the survey is similar to Openreach reporting there is a tendency to include areas about to go live, rather than live on that day, hence why we are expecting Openreach to probably talk of around 700,000 FTTP premises in the next results. The end result of these factors is that we would agree on the terms in the report that things are close to the 1 million mark. The important point though is that the report suggests that by 2025 the number of premises passed by full fibre should be of the order of 14.25 million with a hope of 4.8 million live connections and the message for those without decent broadband is that you should look at the alternatives in addition to the GPO. The full INCA/Point Topic report is available online. According to an exclusive report recently published this week by Variety, Apple Music has now reached a total number of 40 million subscribers. Could Apple’s music streaming subscription service catch up to industry leader Spotify? Maybe not soon, considering that Spotify currently enjoys a subscriber base of about 70 million Premium customers (as of January of this year), and is continuing to offer interesting deals. But a number of industry watchers are already starting to notice Apple Music’s remarkable trajectory. More than a couple of months ago, the Wall Street Journal had reported that Apple Music’s growth rate of five percent is significantly faster compared to Spotify’s two percent. If this momentum keeps up, it is possible that Apple Music could overtake Spotify in three or four months’ time. Last month, Eddy Cue, the senior vice president of Apple’s Internet software and services, had confirmed at the annual South by Southwest Conference and Festivals (more popularly known as the SXSW Fest) that Apple Music had already amassed 38 million subscribers. In a span of just four weeks, that number has increased by a couple of million subscribers. Variety’s exclusive report also made mention of the fact that there is a new vice president of Apple Music & International Content — Oliver Schusser. Reporting directly to Cue, Schusser has been with Apple for more than a dozen years now, and he has had extensive experience when it comes to managing content related to the App Store for mobile markets outside the United States. Now he will put his skills to use in overseeing content for Apple Music for international customers. It has not always been smooth sailing for the Apple Music brand. Just a few months after it made its debut back in June of 2015, it had to go through some interface related issues. This should not be too surprising, considering that Apple Music was at that time a newcomer that had to learn the ropes fast in order to start competing with Spotify, which had the advantage of several years of experience in streamlining its overall user interface. But one can argue that in just a couple of years, Apple Music has managed to be a legitimate contender to Spotify’s dominance. Still, it will be challenging to oust the industry leader from its throne. Last month, Spotify had gone public with a rather high market cap of $28 billion, which suggests it is confident it can remain the top brand to beat in the ever popular music streaming business. There are just six weeks to go until a big shake-up will take place in how broadband package speeds are advertised. The ASA/CAP changes requiring adverts for broadband (which includes listings and product pages) to include a peak time median average speed for the service between 8pm and 10pm are designed to help highlight the performance of different services at the time of day the majority of the public are actually using the service. The big unknown is exactly what the providers are going to use for figures, in the past it was pretty simple, as ADSL2+ invariably appeared as up to 17 Mbps and the basic VDSL2 services as up to 38 Mbps, but since the new system is meant to be based on testing of throughput rather than connection speed there are going to be a lot more variations. With the first quarter of 2018 now over we can share the results from our monitoring of broadband speed tests and compared to our last round-up in March the wider period of a quarter lets us add a couple of packages that were otherwise missing. The analysis since it is a full end to end test will include the influence of the performance of Wi-Fi and therefore we do expect providers to use higher figures, but given the large amount of access to the broadband that is over Wi-Fi including that element in any analysis is important to the overall picture and where providers supply flaky or sub-standard wireless routers our results should reflect that. EE stands out with regards to its quality measure and this looks to be down to a pattern for lots of users where to reach the median speed we record it is taking a couple of seconds. The potential impact of this may not be noticeable on text heavy web sites but as more adopt large hero images and background images users may find that some sites feel less responsive. Virgin Media while often near the top of the speed tables can be a bit of a marmite provider, i.e. when it is working and you are in an uncogested area then the service is brilliant, but if an area sees congestion issues some have found that switching to slower FTTC based services can actually give a better user experience. Our speed test is designed to try and be more reflective of actual use, hence for an individual test we show the median speed as the average result, this median speed figure is what feeds into any our broadband speed analysis too. Some other speed tests show more of a top quartile or even higher peak speed for the result which while it may be good for bragging may not be a real reflection of sustained performance. Plusnet has tweaked its FTTC/VDSL2 pricing with the new offers set to run until 24th April and are based on a 12 month contract. Outside of the low cost areas there is an extra £7.50 per month to pay. For existing customers (which means those who signed up before 4th March) there is a set of price rises to take notice of that will take effect on 5th June 2018. The rules set by Ofcom mean that even those in the minimum term of their contract can migrate away without penality if they leave within 30 days of the notification of price rises, but you need to do some research to make sure that things like activation fees don’t wipe out any savings from a move. If you have paid a lump sum for Line Rental Saver a pro-rata refund will be due if you leave with outstanding balance. The main change is that those on the following products: Essentials, Essentials Fibre, Extra, Extra Fibre, Unlimited, Unlimited Fibre, Value, Value Fibre, Fibre and Fibre Extra will see the monthly cost increase by £1. Additionally there are other increases such as the call set-up fee rising from 21p to 22p. The price rises are partially offset by the caller display feature which is currently 99p per month dropping to free. This is a move not done for love and will apply to all telephone line services since Ofcom is banning charging for caller ID from October, as part of a number of measures to reduce the amount of spam like phone calls. Price rises for broadband given the changes at the wholesale level that Ofcom is imposing on the 40/10 FTTC service is a bit confusing, but while it may look simplistic lose of 99p revenue from caller display balanced by a £1 rise in broadband package pricing seems set to balance out the ARPU on the balance sheet. In previous years the wholesale line rental price was flat or falling and there was still annual price rises, things like moving call centres back to the UK and thus higher prices, or employing more call centre staff are the usual reasons cited. Two of the most recognizable names in the streaming business — Spotify and Hulu — have decided this week to expand an existing bundle to every subscriber of Spotify who is based in the United States. Indeed, all Spotify subscribers will soon get to enjoy a bundled Spotify and Hulu experience, as long as they are willing to pay $13 every month. We last looked at the impact of Openreach cabinets reaching their capacity limits back in 2017 and thus a re-visit is overdue with this latest analysis revealing that currently around 4.1% of UK premises are impacted by a capacity limit on the VDSL2 cabinets. Capacity limits on the Openreach VDSL2 cabinets are down to the operator installing capacity for a limited level of take-up initially and this is important in the gap funded areas since if capacity was installed from day 1 for 100% of lines then the bill to the local authority would be much higher but with roll-out as it stands once the initial cabinet hits a limit any expansion is solely down to Openreach paying. Hitting the capacity limit is one of the reasons people doubt the broadband coverage statistics since some providers checkers do not make it clear that the reason an order cannot be placed is due to a capacity limit, they simply say you cannot order service xyz with the same messaging that you’d get if the cabinet did not exist. The wholesale systems use better wording to convey that you may need to wait, alas the communication of how long the wait will be is where things fall apart currently, for some upgrades adding an extra line card it may be a couple of weeks but if a whole new cabinet is needed it may be months or if wayleaves or power delay things it could be a year (or more in very rare cases). The figures for the impact for cabinets at capacity is a dynamic affair and varies as the upgrades happen but other areas hit a limit, but the latest figures represent the impact of the over 2,200 cabinets we saw in the waiting stage at the end of March 2018. In really popular areas e.g. no cable coverage or cable broadband is congested badly some upgrades last only for a week or two before more work is needed. Percentages reflect the number of premises that are present in the various regions, thus a cabinet serving 450 premises being at capacity will have a greater impact overall than one serving just 180 premises. Coverage figures are taken from our analysis of coverage on 8th April 2018 and data on the cabinets with at capacity messaging from the end of March 2018. The number of active VDSL2 lines on each cabinet is not accounted for, so the numbers will be lower in reality, but those people will also encounter issues in migrating so we have not attempted to compensate. It is only a couple of days since our monthly round up, but the Scotland and Northern Ireland superfast coverage figures have risen by 0.1%, so that difference to the monthly round-up is not a typo. This summary also adds the levels of Openreach VDSL2/FTTP coverage which is not normally included in our news article tables to avoid too many columns but is a bit of detail on the full broadband statistics site, the gap between the Openreach any speed and Openreach superfast figures highlights that the model we have constructed does take into account line length and the performance drop off of VDSL2. One of the most annoying elements with the capacity issue is that it also blocks migrations for those who are already connected to a VDSL2 line card port, and the second most annoying is people moving house where the existing residents had VDSL2 running but the port is placed back into the pool when move out and invariably snapped up by someone closely watching for the cabinet to show capacity and thus when people actually have moved in they can only order ADSL2+. A new quirk since 2017 is that it is possible for a VDSL2 cabinet to be at its capacity but a live G.fast pod to actually have spare ports, but given the faster G.fast services are more expensive we suspect most people will opt to wait. Some campaigners have long called for Openreach to install 100% capacity when rolling out VDSL2 (FTTC) but with a few million FTTP lines expected from Vodafone and TalkTalk in the next year or two there is actually the prospect that the number of VDSL2 ports in use will decrease rapidly maybe making some extra capacity cabinets redundant. The demand for Vodafone and TalkTalk full fibre services is in the first few years likely to be driven by price, e.g. TalkTalk UFO with 940 Mbps maximum speeds is selling at just £21.70 per month and similar agressive pricing is expected from Vodafone. Update 6:30pm A statement from Openreach arrived around 3pm, and this has been added. Our figures if you work to the basic number of cabinets works out at 3.03%, which lines up with the 97% of the Openreach statement. Around 97% of our cabinets are currently open to new orders and we have a dedicated team proactively monitoring take-up across all of our fibre cabinets. On a small number of occasions, cabinets reach capacity before we can upgrade them. Solutions can range from the installation of a line card through to the build of a brand new cabinet. We’re obviously keen to avoid any frustration for people trying to upgrade their broadband and working hard to forecast capacity demand and resolve any issues as quickly as possible. The first three months of this year have proven to be quite a record breaking period, especially in terms of the total volume of mobile apps downloaded and revenues generated around the world, as indicated in the latest report recently released by App Annie. Indeed, from January through March, the number of app downloads from Google Play (Android) and the App Store (iOS) increased over 10 percent compared to the same quarter last year, hitting the 27.5 billion mark, which is the highest recorded ever. On top of that, app spending on both online stores improved 22 percent year over year in order to reach $18.4 billion, also a record shattering figure. For some added context, the methodology that App Annie uses in measuring the total volume of downloads does not in any way take into account app updates or re-installations. As a matter of fact, the firm only counts new app installations, which means that those users re-downloading a particular app on a new handset (which tends to happen during the busy holiday shopping season, or in the weeks after) are not included. As for determining the revenues generated, what App Annie does is count only paid mobile apps, in-app purchases, and subscriptions. It does not count in-app ads, the earnings recorded in online shopping apps and service provider apps (like ride sharing, for instance), and the revenues registered on third party Android app stores across the globe. When the fourth quarter of 2017 had wrapped up, that three month stretch was kind of expected to post record numbers, mainly because any holiday season always sees more consumer spending than any other time of the year. Q4 2017 did indeed meet those expectations, registering the highest ever fourth quarter app download volume in history, surpassing the record set during the previous quarter, which got a boost from China, India, and other Southeast Asian mobile markets. This time around, Q1 2018’s record shattering download numbers on Google Play were helped immensely by India (again), Indonesia, and Brazil mobile markets, while App Store downloads were boosted by the United States, Russia, and Turkey mobile markets. With regards to app spending on Android, its record growth can be attributed to American, Japanese, and Filipino consumers. On Google Play, spending increased 25 percent compared to the previous year’s, while on the App Store, spending grew 20 percent year over year. To know more about App Annie’s latest findings, read the entire report here.